First and foremost, I am a lover of words and the stories they create. I write because I must allow myself to unfold my own stories on the page. I do this as a way to teach and support my coaching practice. I create courses to help folks get from here to there. I wrote about about Creating a Life You Love and published my collection as a book. Most of all, though, I write because it’s how I unearth my own truths. My writing studio is set up in the lower level of our home. We have a “basement walk-out” and so each morning, I commute downstairs. While I can easily walk outside and watch the golfers or the geese, I work better down here than I did when I worked upstairs in a room that faced the street. A peek into the door reveals this vintage desk. It was John’s father’s desk and before that it was his grandfather’s desk. I love it’s shape but most of all I love the energy. I scatter favorite photos and sometimes candles here. That lamp is one I received for Christmas the year that I was 12 and it has illuminated many of my words over the last thirty-six years. You’ll see my art, most of which consists of photographs I’ve taken. Photos that have special meanings. Like the Cherry Blossom photos I took the weekend I met John for the first time…subsequent peeks of DC and Central Park in the Fall. And to the left of the door you’ll find the only recycled item in my office: an old TV stand serves as a space to store cards, stationary, and cuttings from magazines for future vision boards. 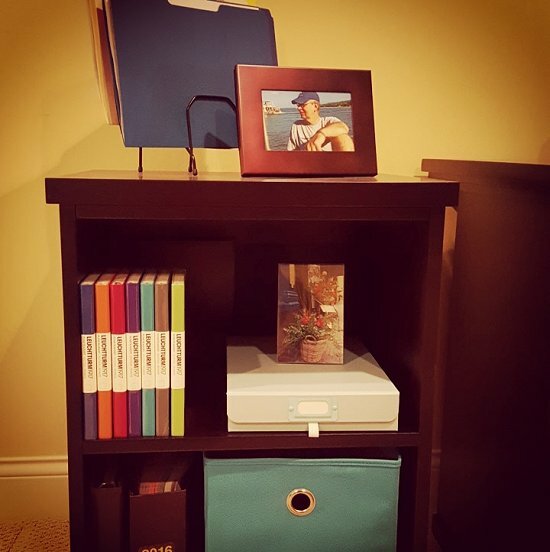 I am in love with these document boxes and these soft bins. And, of course, flowers. 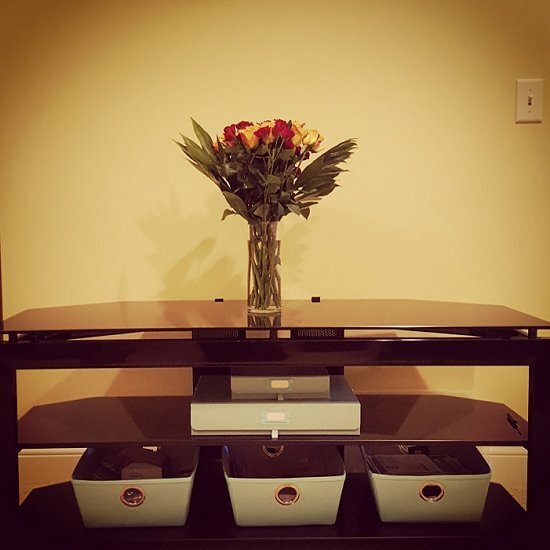 I love having fresh flowers in my office. Yes, I chose this room due to its lack of windows because like Mark Twain, I’m curious about the world outside and therefore prone to distraction. And like Twain, my desk faces the corner. I love this desk, by the way. 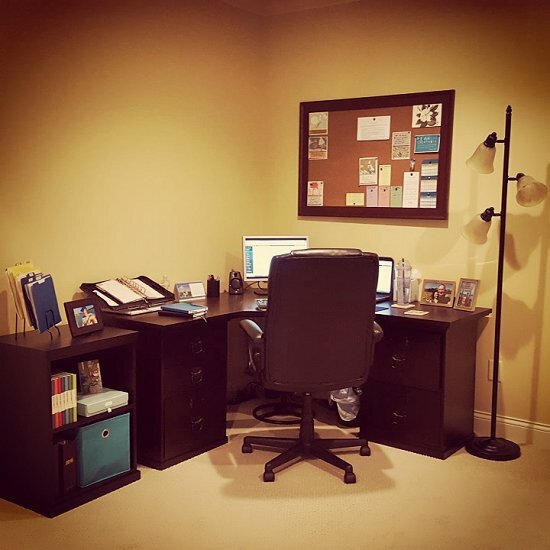 It’s the Bedford Corner desk from Pottery Barn and it’s the first time I’ve ever invested in this kind of piece for myself rather than buy the cheapest thing I could find or making do with a recycled item from elsewhere in the house. It was an investment in myself and my work in a writer that went beyond the actual dollar figure spent. Purchasing this desk was a sign of commitment to this life here in Ohio. A commitment to writing. A reminder of love, belonging, and sanctuary. I have everything at hand: My planner, my journal, and computer (with a new monitor on my wishlist). Favorite pens and of course space for the necessities of life (coffee) and favorite photos. Each item here has been purposely cultivated because everything has energy. To the left of my desk is a matching bookshelf with a stock of Leuchtturm1917 Notebooks in a rainbow of colors…I like having extra journals on hand because you never know when you’ll need a new one. The letters I’ve received are stored here …. and on top, one of my favorite photos of John (taken on our 2015 Vacation) and a stack of files for various trips and projects. 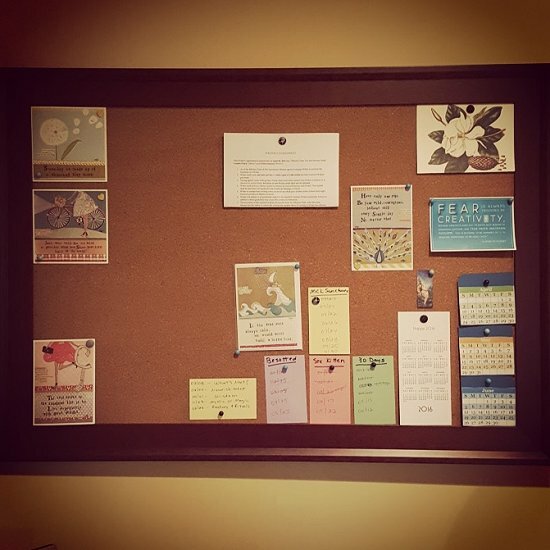 Above my desk is my cork-board, where I have a variety of inspirational quotes and cards mixed in with calendars and little note cards outlining various deadlines for projects. I wasn’t able to find a board that I loved, so I had this one made at a local craft store, choosing a light-weight frame that matched all the framed art in my office and having them wet-mount cork instead of art. My Bookshelves are across my from desk. 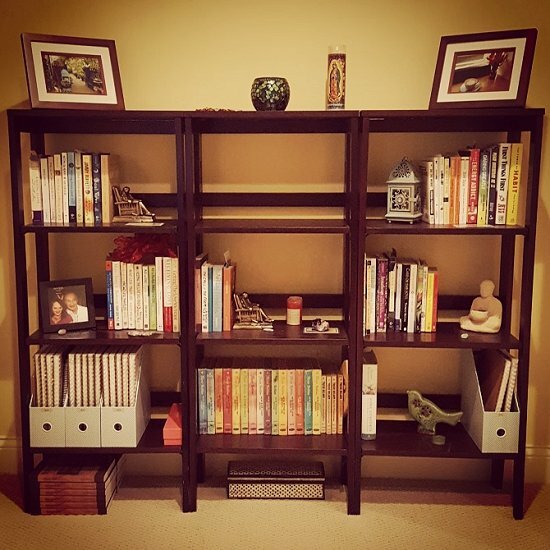 These bookshelves are the only furniture I brought with me from Texas to Ohio when I did that massive de-cluttering in 2010….Reference books and loved books abound. Old journals. More photos I’ve taken and framed. The final few copies of the 3rd printing of my book. Scattered about are sacred talismans as well. Like on my desk, each item has been cultivated for my space. I quarterly look at each book and item to see what needs to go. 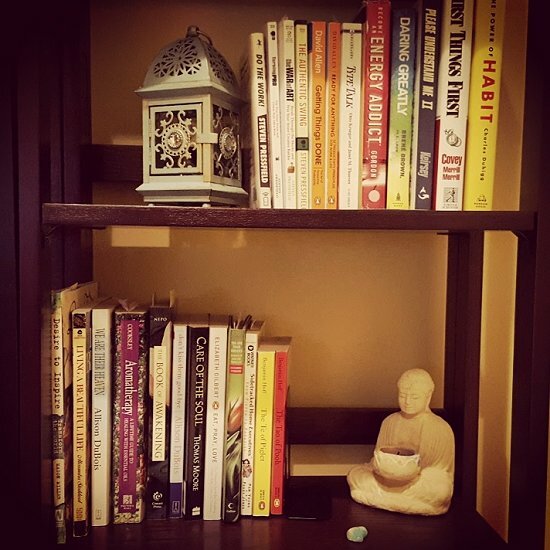 Books for coaching and living stand alongside tokens and reminders. The lantern to remind me that my role is to serve as a light and guide for my coaching clients….and a Buddha candle holder and heart-shaped stone to remind me of my responsibility to tend my own soul. 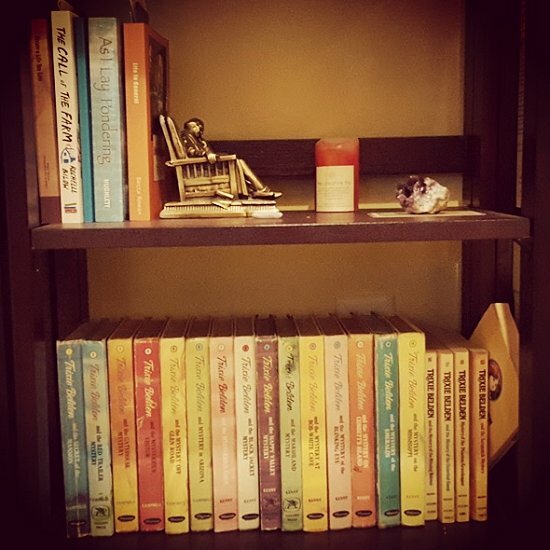 Books by dear friends, prayer cards and crystals and candles…and some of my beloved Trixie Belden books. 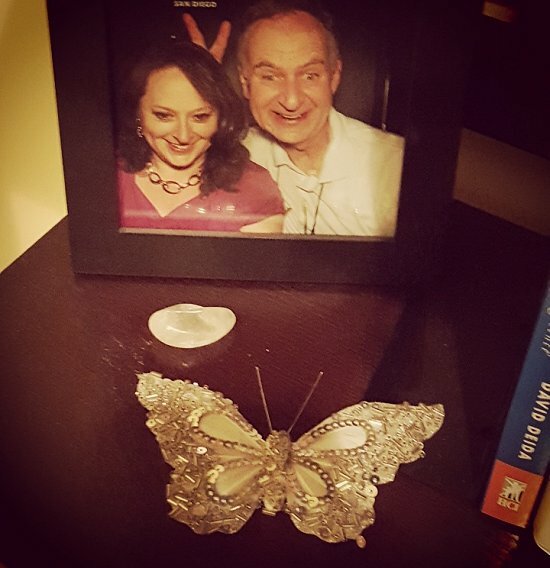 A photo of John and I fooling around in a photo booth reminds me of the joy and laughter and love we share…and here, also, are tiny talismans: a rose quartz, a butterfly from the roses he sent me on our first Valentine’s…and these sit alongside my favorite books on love and intimate relationships. Not pictured: the dozens of candles that make their way into my space. 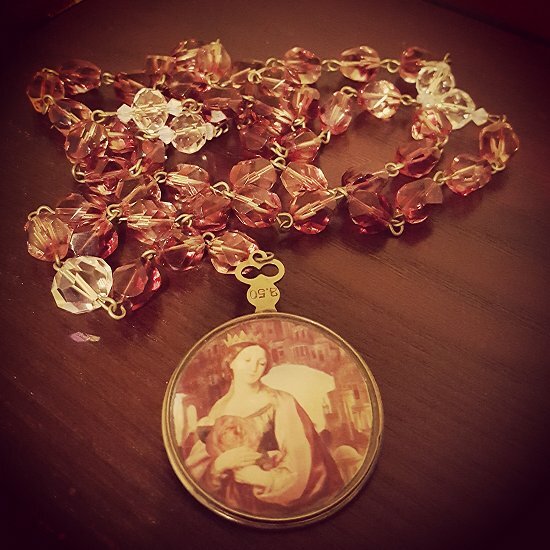 I light them as prayers for sick friends and when I begin a new project. I light ones for specific intentions, in honor of specific souls passed, and as a beacon of light. 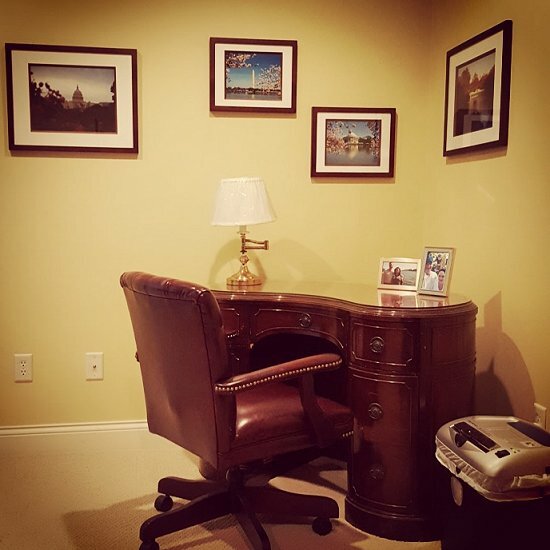 Virginia Wolfe said that a woman needs a room of her own in order to write…and I am so grateful that I have this room to serve me as my writing studio. Oh, you have WAY more Trixie B. books than I have! I wonder if anyone reads her anymore or if they are too dated. I’ll have to find out and re-read them this summer. Your space is lovely. You would have a panic attack in mine. I keep thinking I need to clean, declutter — but I’m too busy making art and writing. Which I suppose isn’t a bad problem to have… just a messy one! I’ve been thinking about your question, Jeanie. I think some of the elements of Trixie would stand up to readers today – any little girl looking for a little excitement, inspiring friendships, and loving family and friends. But, without the “modern” elements (internet, cell phones, etc) I don’t know if they would connect to the core of the stories beyond age 8 or so. Which I find is so sad. And thank you on my office. I likely would NOT have a panic attack in yours because most of my life I’ve been very disorganized, so clutter feels like HOME – yet, for me, personally, I’ve found that the clutter just distracts me from one project to the next, like a bee hunting for that taste of nectar. So, I had to learn to keep things a little more on the tidy side if I ever want to get things done! Next PostNext 100 Days Project: What Would YOU Do With 100 Days of Making?